Name Deconstructor picks apart keywords to find good substitutes. It finds words within your words, including ones in non-English languages. This is great for brainstorming. Additional tools are available for a monthly subscription fee. 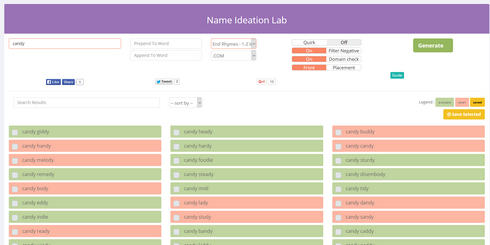 Name Ideation Lab builds on the Name Suggestion Engine to give you more flexibility. For example, you can pick rhyming words and even chose how much of the word to rhyme with. You can also have it plug in substitute words. The Brand Name Generator asks for a few inputs and then creates a number of branded terms. First, you choose if the name is for a product or service. Then you pick a type of name, such as Edgy, Elegant or Cute, followed by a type of service such as education, fitness or business. After entering a sentence that describes your product or business, you get a list of available domain names that might work as a brand. Choosing Edgy, Business and “Software for completing your tax returns,” I got results such as TaxLect.com, TaxFinish.com, and Taxlingual.com. Appellita uses Natural Language Processing in the background. There are a bunch of free naming tools on the market. Appellita includes some interesting innovations that make both its free and paid versions worth trying. This entry was posted on samedi, novembre 21st, 2015 at 13:51	and is filed under Actualités. You can follow any responses to this entry through the RSS 2.0 feed. You can skip to the end and leave a response. Pinging is currently not allowed.